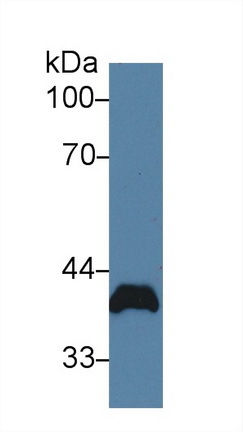 The antibody is a rabbit polyclonal antibody raised against PVR. 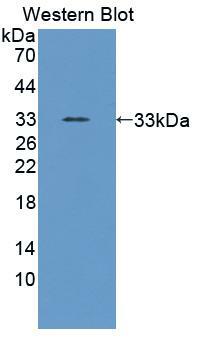 It has been selected for its ability to recognize PVR in immunohistochemical staining and western blotting. Small volumes of anti-PVR antibody vial(s) may occasionally become entrapped in the seal of the product vial during shipment and storage. If necessary, briefly centrifuge the vial on a tabletop centrifuge to dislodge any liquid in the container`s cap. Certain products may require to ship with dry ice and additional dry ice fee may apply. NCBI/Uniprot data below describe general gene information for PVR. It may not necessarily be applicable to this product. PVR: Mediates NK cell adhesion and triggers NK cell effector functions. Binds two different NK cell receptors: CD96 and CD226. These interactions accumulates at the cell-cell contact site, leading to the formation of a mature immunological synapse between NK cell and target cell. This may trigger adhesion and secretion of lytic granules and IFN-gamma and activate cytoxicity of activated NK cells. May also promote NK cell-target cell modular exchange, and PVR transfer to the NK cell. This transfer is more important in some tumor cells expressing a lot of PVR, and may trigger fratricide NK cell activation, providing tumors with a mechanism of immunoevasion. Plays a role in mediating tumor cell invasion and migration. Serves as a receptor for poliovirus attachment to target cells. May play a role in axonal transport of poliovirus, by targeting virion-PVR-containing endocytic vesicles to the microtubular network through interaction with DYNLT1. This interaction would drive the virus-containing vesicle to the axonal retrograde transport. Belongs to the nectin family. 4 isoforms of the human protein are produced by alternative splicing. Protein type: Immunoglobulin superfamily; Membrane protein, integral; Motility/polarity/chemotaxis; Receptor, misc. 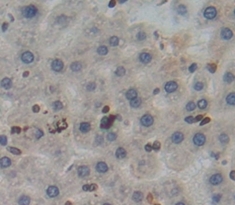 1. report the in vivo induction of necl-5 in hepatocytes and provide evidence that both necl-5 mRNA and protein are tightly regulated in adult epithelial cells and tissue.